The Everglades Nutrient Removal Project (ENRP) is a 1,545-ha prototype wetland constructed to test a larger system of stormwater-treatment areas that is being used to remove agricultural nutrients and help restore the remnant Everglades. Concerns that the ENRP may lead to mercury bioaccumulation as observed in other newly created reservoirs resulted in an effort to construct a mercury mass budget and measure bioaccumulation in aquatic organisms. 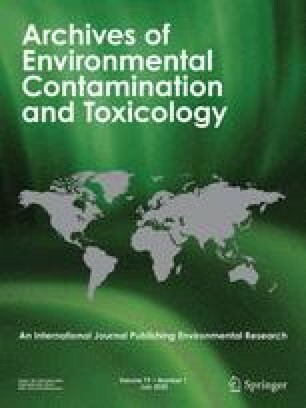 For the first 2 years of operation, total mercury (THg) and methylmercury (MeHg) concentrations in water decreased significantly a short distance into the ENRP, probably through particle settling. During both years, THg concentrations in largemouth bass were about 0.1 μg/g throughout the ENRP while the adjacent Water Conservation Area bass were at or above the state health advisory level of 0.5 μg/g. THg levels in mosquitofish were lower than levels found in bass, and mosquitofish mercury concentrations in the interior of the ENRP were significantly lower than the inflow and outflow sites. The major THg pool was the sediment while less than 1% the total mass was stored in vegetation, water, and fish. The major MeHg pool also was the sediment but vegetation, water, and fish were significant fractions. Mass budget estimates showed the inflow pump and rainfall to be the major sources of THg, while the outflow pump was the major output. The inflow pump was the major source of MeHg while the outflow pump was the major output. Evasion of elemental mercury estimated by the stagnant-film model indicated a minor loss, but field measurements over cattails suggested that evasion may be the major pathway. When all inputs and outputs were considered, the ENRP removed about 70% of the THg and MeHg masses in the first 2 years of operation.